HUANUO COMPUTER TOWER HOLDER, KEEP YOUR TOWER SAFE & SAVE SPACE UNDER DESK! Have you ever worried about the safety of your computer tower? Have you ever had the hassle of trying to access the cables on the back of the computer tower in the limited under your desk? Our HUANUO under desk CPU mount is here to help and make your life that little bit easier. 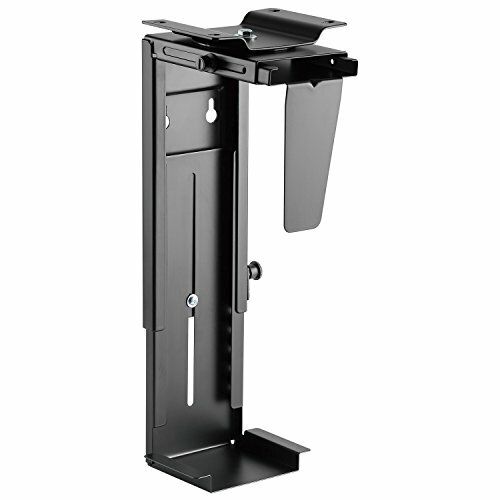 Instead of placing your computer tower on the floor in harms way, HUANUO CPU mount can securely hold the tower under your desk or on the wall with a steel bracket, keeping it safe from accidents. By hanging and holding the computer tower under the desk, your CPU mount adds more space for your feet to enjoy and a better and more comfortable sitting posture. As the CPU is off the ground, it is more convenient to clean the floor and keep each corner free from dirt. The height of HUANUO CPU mount can be adjusted to from 11.81" to 21.65"(or 12.6" to 21.65") and the width can be adjusted from 2.95" to 8.11", so it widely fits most computer towers in different types and sizes in the market. HUANUO CPU stand features a smooth 360°swivel which makes it super easy to access your cables. Inserting and removing the cables on the back of the computer tower is no longer a hassle! The vertical steel plate keeps the computer tower stand on the mount safely, the inside of HUANUO CPU mount comes with sticky EVA pads, protecting your computer tower and the mount itself from potential scratches. Comes with related hardware accessories and detailed installation guide, HUANUO CPU mount is easy to install. Height adjustments: From 11.81" to 20.87" OR 12.6" to 21.65"
Width adjustments: From 2.95" to 8.11"